I really spoiled myself with the extra money I got at the end of the year. Early this week a package full of yarn arrived from English Yarns. 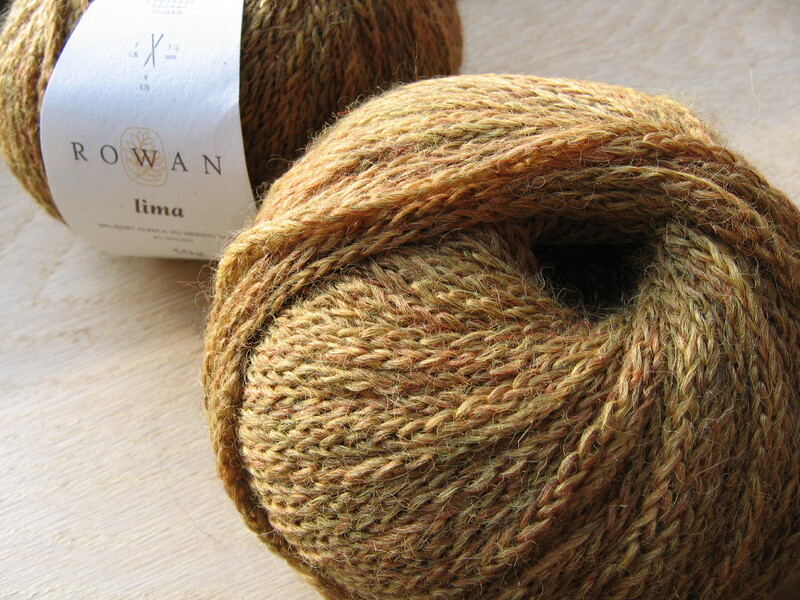 In it: Rowan Lima, Rowan Fine Milk Cotton and 5 different colours of Scottish Tweed 4ply. The colours look all so nice together. I love autumnal colours. It’s an extremely soft yarn. Just as soft as the Cashmerino from Debbie Bliss, which is the softest yarn I’ve ever worked with. I love it. The colour is very beautiful too, a heathered colour, ochre and beige/brown. I am very curious how it will knit up because it is a knitted tube yarn. I am probably going to use it for a hat. 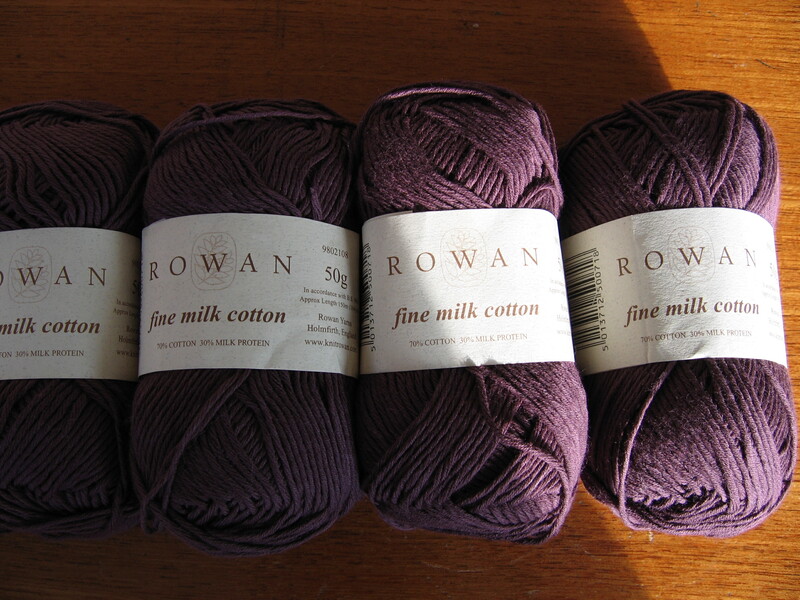 This is Fine Milk Cotton to knit Rue from Marie Wallin, from Rowan 45. It is a very nice understated top. It has little frills in crochet, in Shimmer. But I don’t really care for silvery yarns. It looks awesome in the magazine, because the light blue colour she used and the silver lay very close together. But on the aubergine it would stand out more, I wouldn’t like that. I am going to make a plain Rue, or I am going to learn to crochet and make them in Malabrigo lace, in the lilac colour I have in stash. It depends on how it looks when I’ve done the knitted parts. I would love to learn to crochet some day, maybe this top will be a start. We’ll see. 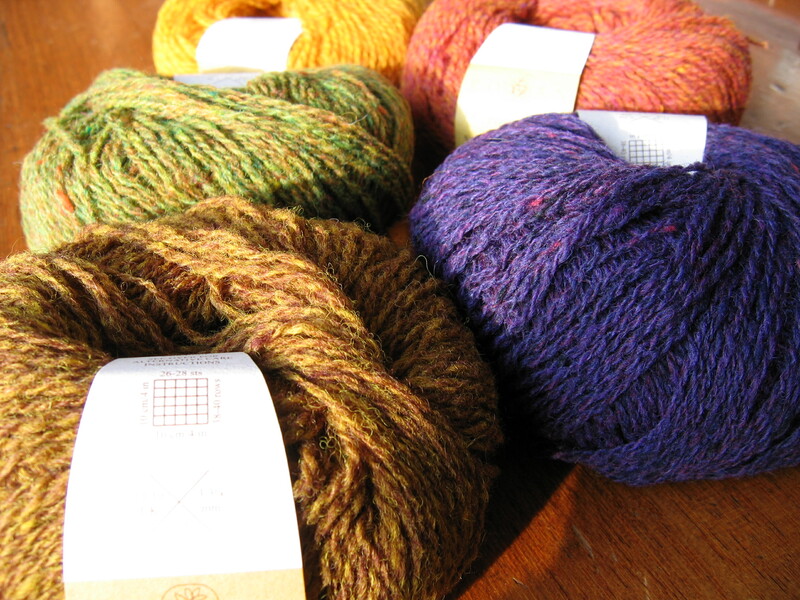 This is Rowan Scottish Tweed 4ply, in Thatch, Thistle, Apple, Gold and Rust. The thistle is a bit more blueish than it was on my computer screen, but never mind. I am going to use those for the Fair Isle Yoke from A Stitch in Time. 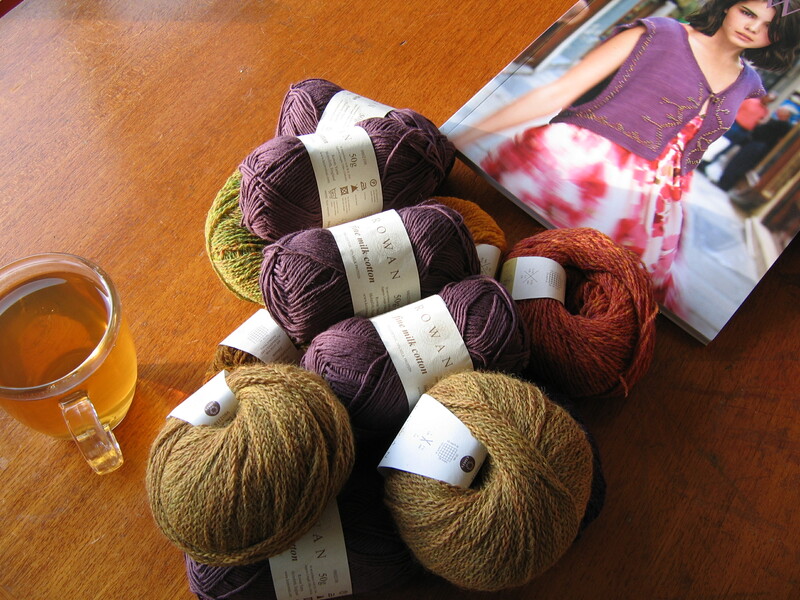 I have 10 balls of Scottish Tweed in Heath (light brown) in my stash, I originally bought them to make Joy from Rowan Vintage Style, but I read on Ravelry that the yarn amount in the book wasn’t right. So I’ve finally found another project for it. That sweater is originally knitted in Jamieson and Smith’s 2ply jumper yarn, and I would love to try that yarn some day too. But I want to try so many yarns. My yarn stash is growing (how can this be ), it doesn’t fit in my drawers anymore. I’ve already written a post about Rowan 47, but it is even better in real life. I bought it from Hulucrafts and it was here was really quickly. I want to knit so many things from it. I think I am going to start with Torquay from Sarah Dallas. It looks like a nice uncomplicated knit, and I think it will be lovely to wear. And after that Bournemouth from Brandon Mably. I already thought this design would be from him or from Kaffe Fasset, it is such an unusual colour combination. I made a real analysis of this colour combination, because I wanted to sub the colours (pink isn’t for me). I thought at first that those were four contrasting colours. But after trying the design out in a lot of different colours (I made drawings), I found that the only real contrast is between the light green and the pink. The others colours are white, which is a neutral colour and two different shades of pink. Those pinks look like contrasting colours but are from the same colour family. So I made another drawing with only one contrasting colour and that was really the best one. I am going to use Ochre, Umber (from the same colour family), Whey (almost white) and Baked Red as the contrast colour. I had lots of fun with it. I am wondering if the designer gave this combination much thought or just threw the colours together. But also in this last case it has to be a person who has much experience in working with colours. This entry was posted in pattern books, yarn. Bookmark the permalink.